This article provides some tips and trick on how to access your boards quickly. On the main dashboard are listed all projects and boards you are assigned to. You open a board by clicking on the board's name. If you are already working on a board, there are some ways how to quickly open another board without having to go back to the main dashboard. 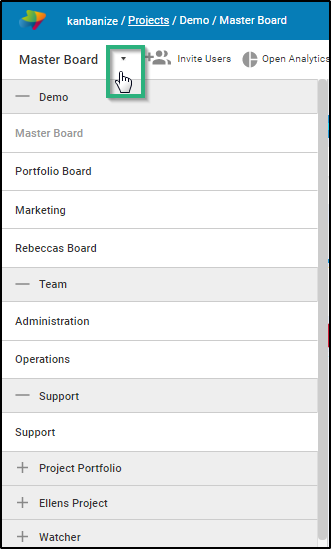 If you work on a board and you want to open another board -> click on the board name dropdown menu (this will open a list of all projects and boards you are assigned to) -> select the board you wish to open -> click on the board's name with the scroll wheel. The board will be opened in a new browser tab. You can also right click on the board's name and select "Open link in new tab". If there are many boards you are assigned to but you do not use them frequently, you can fold the project by clicking on its name and make the list shorter this way to reduce the scrolling. The order in which your projects are listed on your main dashboard is reflected on their order in the boards name dropdown menu. Therefore, it is recommended to fold and move down in the list projects you do not use frequently. This is a very convenient way to access your boards quickly. 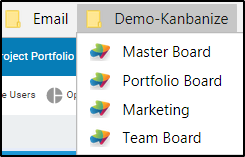 Create a bookmark folder for your Kanbanize account in your bookmarks bar -> Bookmark the pages of the boards that you use frequently. Use the bookmarks to open your desired board. If you do not log out from Kanbanize after each session, your board will be directly loaded when you click on the bookmark. If you have logged out from your account, you will be led to your login page and the board will open automatically after you have logged in. Tip: Open several boards simultaneously in different tabs when working in your Kanbanize account will make switching from one board to another easier.